The Page 69 Test: "Cold Spectrum"
Cold Spectrum marks a turning point in the Harmony Black series, and the climax of a plot thread that began back in the first novel. For the last three books, our heroines have battled our nation’s occult enemies while chasing a more metaphorical ghost: a shuttered black-ops program, codenamed Cold Spectrum, with links to domestic surveillance and the illegal assassination of American citizens. 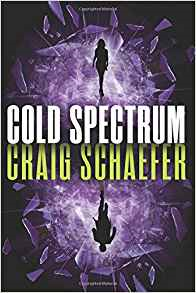 No one knows exactly what Cold Spectrum’s purpose was, or why the operation’s members were hunted and murdered one by one, but it’s a secret that forces deep inside the government are desperate to keep buried. And for the last three books, Harmony has lived in a world of black and white. Clear right and wrong, good guys and bad guys. But as her investigation gets too close, the blowback turns her entire world upside down. She and her partner Jessie are accused of a massacre and branded as traitors, and the organization they trusted – the organization Harmony has called home for years, and gave her a mission and a purpose in life – has turned on them. Nothing is black and white anymore, and Harmony is forced to confront the fact that nothing ever really was outside the blinders she’s willingly worn her entire life. These are desperate times, and for her and her team to survive, she’s going to have to cross some battle lines. I stepped outside. A pickup rumbled past, kicking up a cloud of dust, the sun starting to droop low on the bayou. A wet heat hung in the air, sticking in my lungs and making the shoulders of my blouse cling to my skin. Fontaine, a body-jumping bounty hunter in service to the courts of Hell, has been a constant shadow on Harmony’s heels. The loyal opposition at best, or an enemy waiting to strike. This time, though, he’s the only person Harmony can turn to. On page 69, she swallows her pride and calls him – both to press him for information, and to ask for a favor. Caitlin is the right hand of a demon prince, and an active agent in the slow infernal takeover of our world. Any other day, she’d be Harmony’s mortal enemy. But the enemy of one’s enemy is…maybe, just maybe, a temporary and dangerous ally. And the powers behind Cold Spectrum are a threat to Harmony and Caitlin alike. Can Harmony brush shoulders with the forces she’s dedicated her life to opposing, and walk away uncorrupted? Well, page 69 starts to ask the question. The rest of the book is the answer. Not a clean and clear answer, but as Harmony is learning, real answers never are.